I’d been scouring the internet (food bogs in particular) for a good brownie recipe ever since I volunteered to be in charge of dessert for a recent potluck at work. This recipe caught my eye and I decided to give it a shot. I’m so glad I did because it turned out to undoubtedly be the best brownies I’ve ever eaten, and I’ve eaten several! 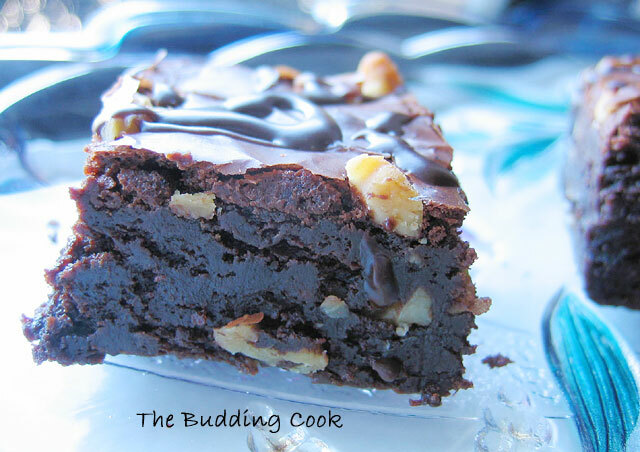 I love a rich, fudgy and moist brownie, and this one certainly fits the bill. Preheat the oven to 350 degrees F. Line an 8 inch square baking pan with foil and grease well with butter. Melt the chocolate and butter on medium heat checking to make sure that the chocolate does not burn. I use a microwave for this, but you could also use a double boiler. Mix well to combine. Whisk together eggs and sugar until foamy and pale, 2 to 3 minutes. Add salt, vanilla, and cocoa powder and mix well to combine. Add the melted chocolate mixture and mix well until combined. Stir in the chopped walnuts. Sift the flour and baking powder over the mixture and whisk to combine. Pour the batter into the prepared pan and spread evenly. Smooth the top out with a spatula. Sprinkle the reserved walnuts on top. Bake in the oven for about 25 to 30 minutes or until a toothpick inserted into the center comes out relatively clean. To make it a little fancy, I also drizzled some chocolate sauce (prepared by mixing melted butter, sweet chocolate, milk and some vanilla extract) over the top of the brownies once they had cooled. The brownies were a HUGE hit at work and I got a lot of compliments. WOw this brownies are sunfully delicious. It looks so chocolaty and moist. Wish i could have a huge piece from that. The more i see that pic from here the more i get the temptation to make it. Good God, HC! You are quick! That looks moist and chewy! Too tempting..
wow, I wish I was at the party to enjoy these yummy brownies! Beautiful picture. That first picture is mindblowing.. absolutely tempting and you are right.. so rich and fudgy. I've got to try this. Brownies are a perfect autumn treat. I've been craving brownies and just might give these ones a try. Your picture is irresistible. These look super moist and rich! I love brownies and these look yummy. Truly a killer dessert, looks so moist and yummy. i always wanted to have brownies to be so moist that i never ended making them........this is so delicious....rich chocolaty color makes me go ga-ga..
Those brownies are amazing, TBC. And I do love your new header. This looks delish! I am just newly married and starting to experiment myself in the kitchen! I am adding you on to my blog roll. 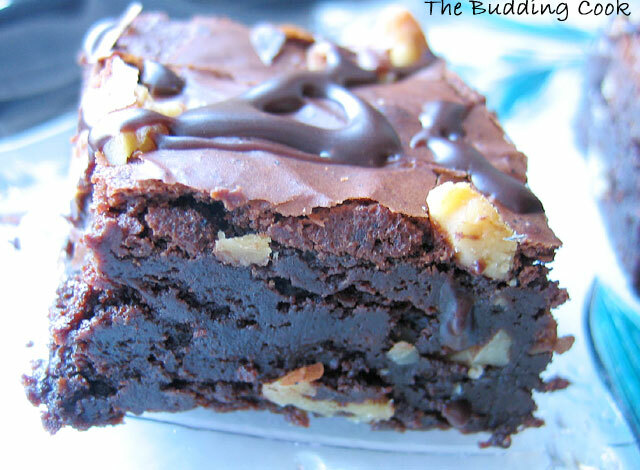 the pic of that brownie looks fantastic:) so many recipes I have missed. You're a bad, bad woman :) sinfully good! Laavanya, If, Kalai and Raaji- I'm sure you'll love these brownies. Anita's recipe is fabulous! Jennifer- welcome! and thank you! would you believe that brownie! it looks awfully good! so moist and fudgy, i can imagine digging my teeth into them right now. i am such a slave to chocolate i tell you.